Small glass vial 1.10" tall X 0.58" diameter is about half full of small radioactive vaseline glass chunks and ground up vaseline glass powder. 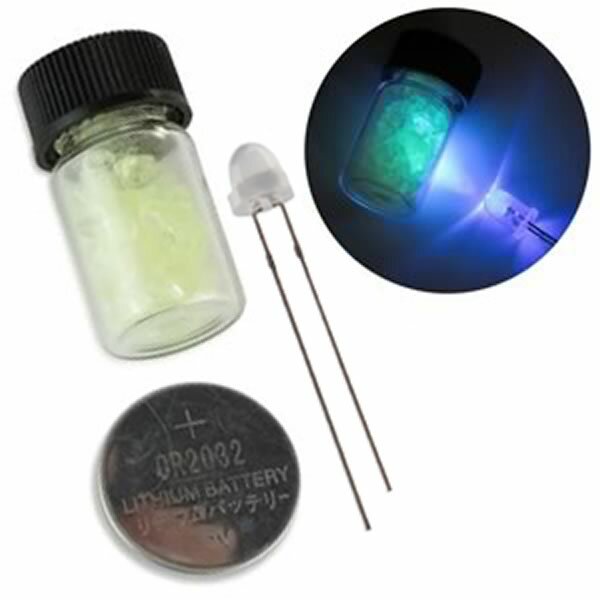 The combo package includes a UV LED and a CR2032 coin battery. When you place the leads across the coin battery (long lead on +), the vial will light up a bright green from the fluorescence property of the vaseline glass. If you pour out the glass powder/chunks in a pile and bring a sensitive Geiger counter near it (such as our C8600 with a SBM29 tube) the counter will increase its clicking, indicating the slight radioactivity of the vaseline glass particles.